At Couture De Bride, you will find the largest selection of Modest Wedding Dresses. 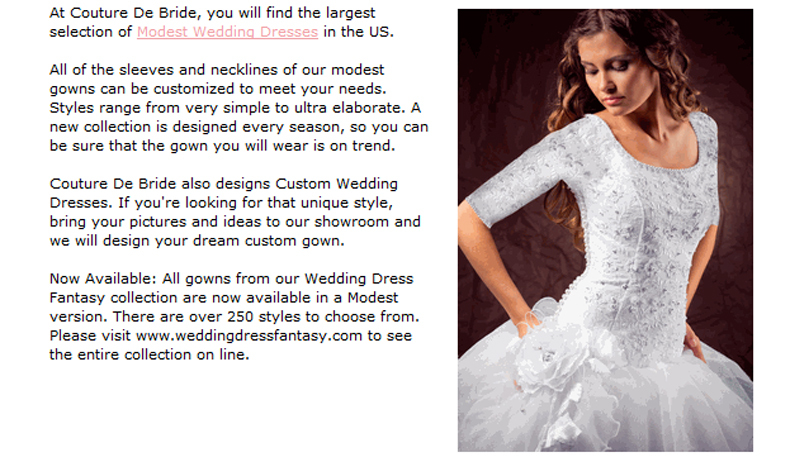 All of the sleeves and necklines of our modest gowns can be modified to meet your needs. Styles range from very simple to ultra elaborate. A new collection is designed every season, so you can be sure that the gown you will wear is on trend. Couture De Bride also designs Custom Wedding Dresses. If you’re looking for that unique style, bring your pictures and ideas to our showroom and we will design your dream custom gown.